Holiday is near! 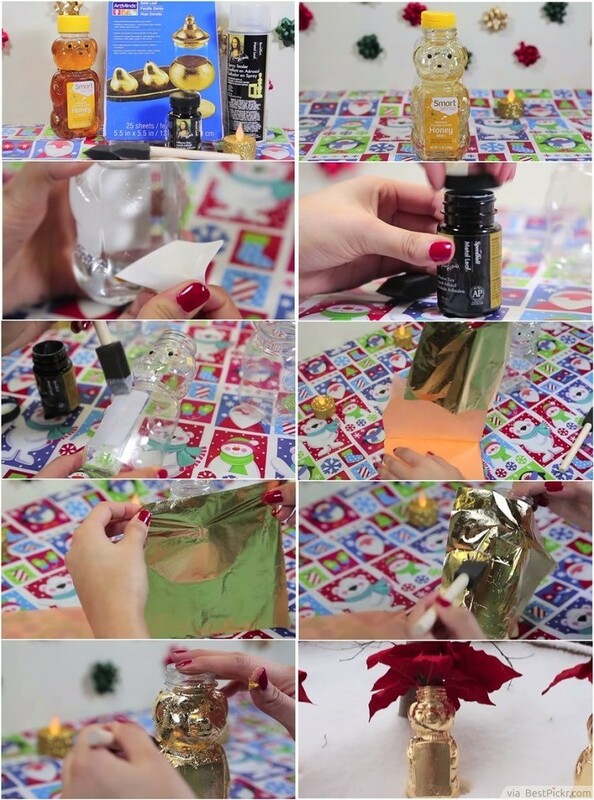 It's time for awesome DIY Christmas gifts and lots of fun making them. Here are some quick, easy and affordable gift ideas that are unforgettable, and best for family, friends and loved ones. All of them have a handmade look and are personalized to your loved ones. These gifts carry special feelings because the person receiving the present will know that you spent time making them. 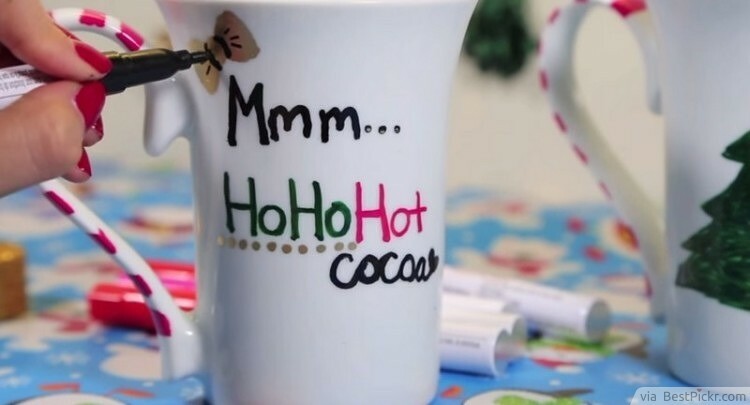 This is a very cute and awesome christmas gift idea that you can make for someone that you love. It’s very special and personal, yet extremely easy to make. 1. 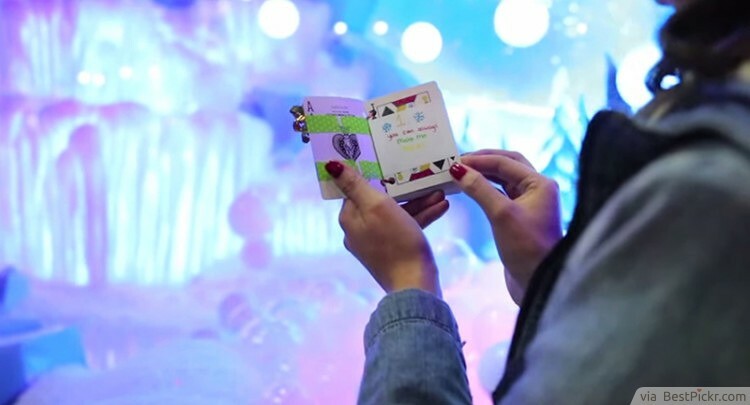 Start by punching two holes into each card on the same side. Since we cannot punch holes through them all at once, take four at a time and punch the holes in. 2. After you’re finished with punching in holes, take a sticker label and stick it onto a card. This will be the cover of your little book. Decorate it the way you would like to and write 52 Things I Love About You onto it. You can also place colorful stickers, draw something or whatever you want. 3. Put sticker labels onto the rest of the cards. Write one thing that you love about the person onto each one. 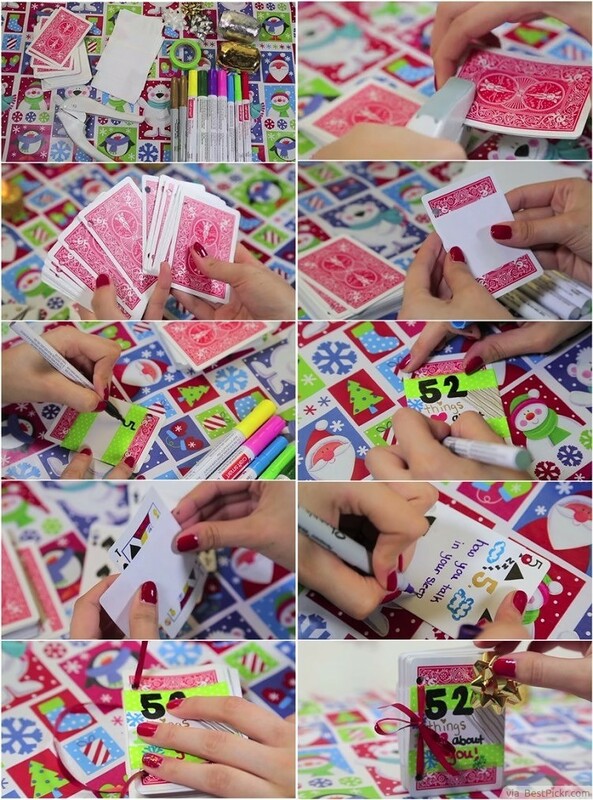 Decorate each card the way you want to. Try to be as creative as you can. 4. When you’re finished with this, take a little ribbon and put it through the holes. 5. Tie the ribbon into a bow and you’re done! 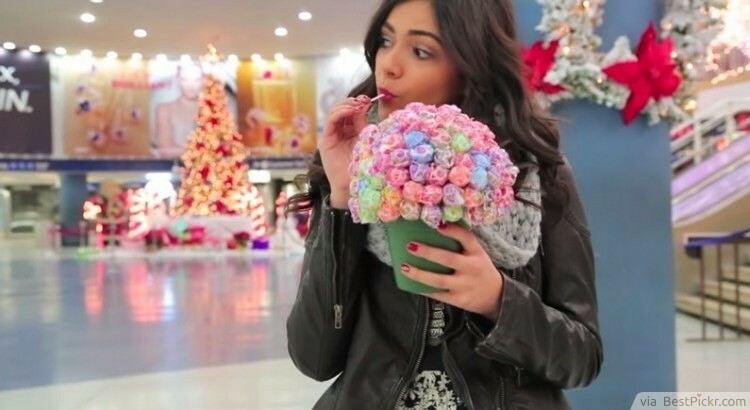 This gift is ideal for almost everyone, especially if they enjoy candy. It’s fun, colorful and very adorable. It’s also very easy to make! 1. Start by painting your pot any color that you prefer. 2. Place the foam ball into the pot. 3. Stab the foam ball with your lollipops. It’s very easy! You can arrange the lollipops any way you want. 4. 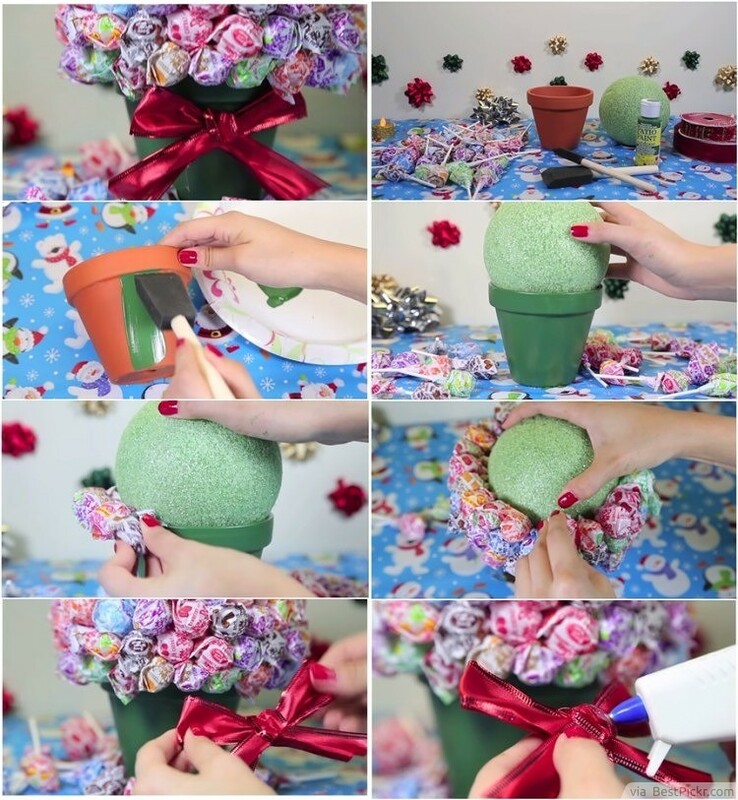 Take some ribbon, arrange it into any shape you like and glue it to the pot. 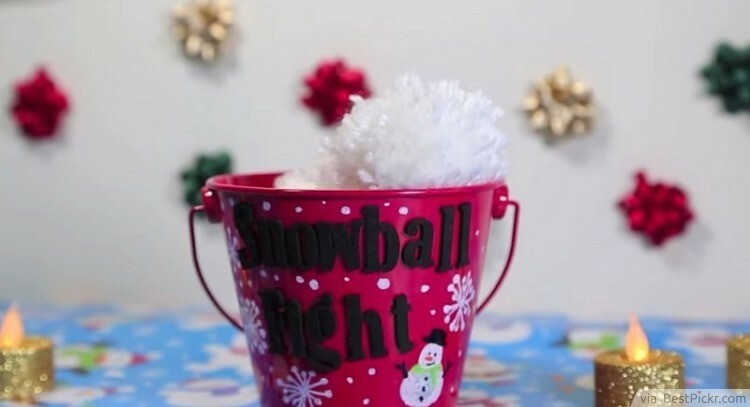 If you need a gift for a toddler or small child, the “Snowball Fight” DIY gift is the perfect choice! It’s quite easy to make, extremely fun to play with, but also quite safe. 1. 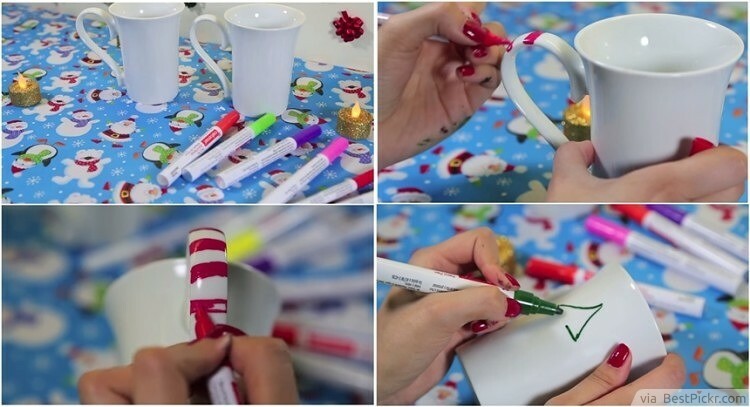 Take your bucket and decorate it with the paint markers. Be creative! 2. Take the stick on letters and place them onto the bucket. Spell out “Snowball Fight”! 3. Take the white yarn and wrap it around your fingers. 4. Cut off the rest of the yarn when you wrap enough of it. 5. Take a ten inch strip of the yarn and thread it through your fingers. 6. Tie the strip of yarn that you threaded into a really tight knot. 7. Remove the yarn from your fingers. 8. You will see a bunch of little loops. 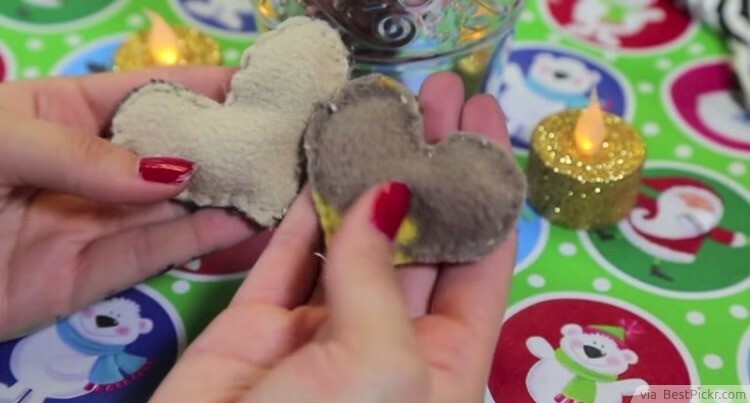 Take your scissors and cut through the loops to reveal your little pom-pom. You can make them in any sizes, depending on how many fingers you wrap the yarn around. 9. Make enough to fill up your bucket. Another great gift is to make a customized phone case for your loved one. In fact, you can make several of these and give them to someone as one gift, so that they can have several. 1. 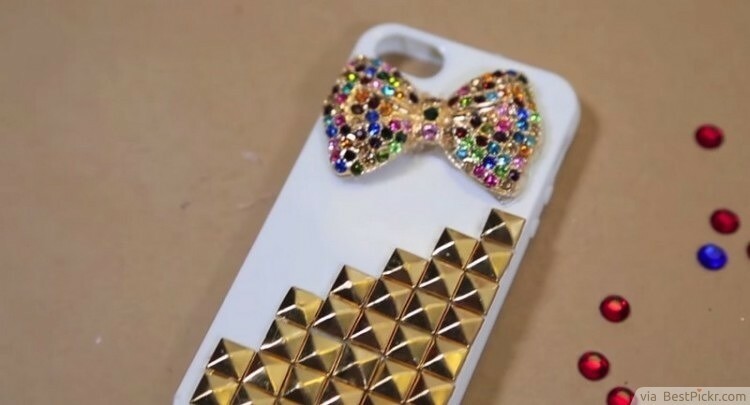 For the first case, take some rhinestones and studs and hot glue them onto the case. You can find rhinestones and studs, as well as similar decorations, at your local crafts store. 2. For the second case, take some of the acrylic caulk, put a decorator’s tip onto it and place it onto the case. It will look like frosting. The caulk is similar to white silicone and it will dry easily. 3. Place some gems onto the caulk before it dries. This gift is ideal for someone who likes to decorate their house, or change things around their room often. They will definitely love this cool Christmas gift idea! 1. 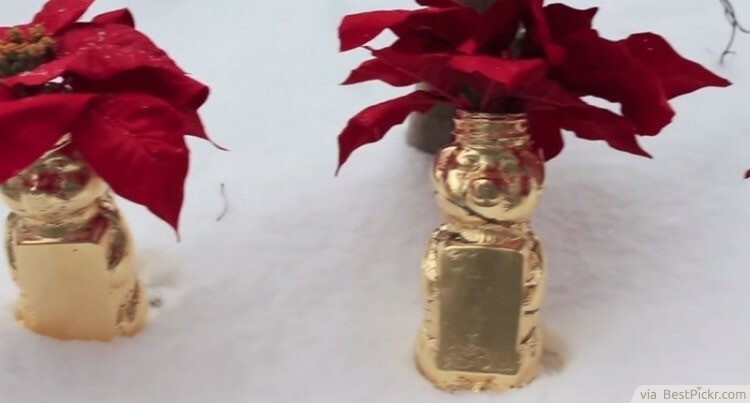 In this example we are going to use a Honey Bear container. However, you can choose anything you want for your base. Remove the honey from the container. 2. Remove the labels from the container. If you put hot water into the container, the labels will remove easier. 3. Apply a thin layer of the adhesive onto the container. 4. Take a sheet of the gold leaf and apply it to your surface. Smooth it out with a foam brush. 5. After that, apply the sealer so that you can make sure the gold leaf doesn’t flake off. 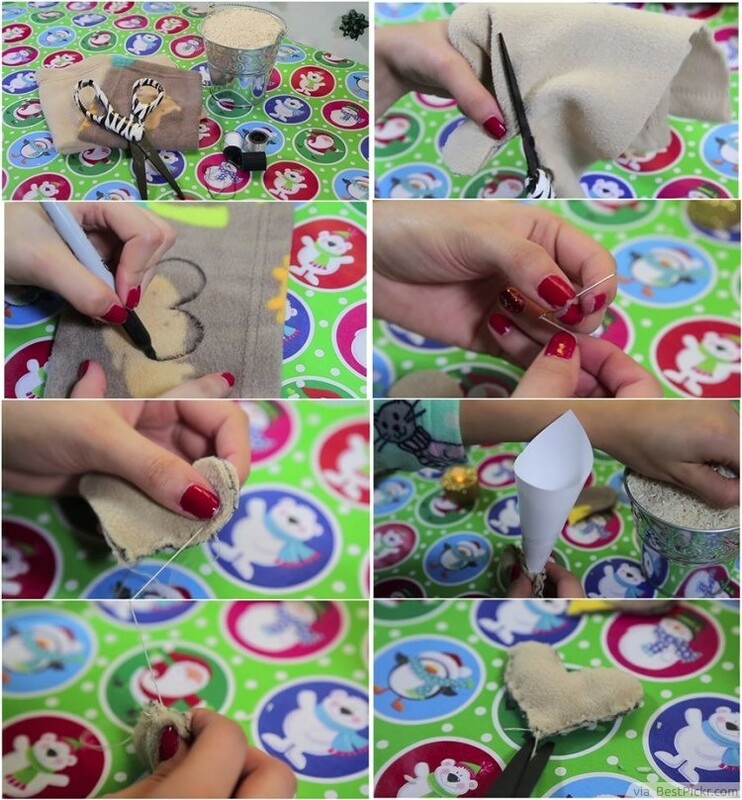 Custom hand warmers are a very adorable, yet useful Christmas gifts that you can easily make for your friend, loved one or family member. 1. Cut out the shape of your hand warmers. 2. Make sure you use fleece or flannel for your material because if you use something like polyester, it will melt in your microwave when you heat them up later. 3. Sew your cutout shape together until there’s just a little hole left. 4. Fill up the warmer with rice. 5. Sew it up completely to close the hole and then cut off the excess thread. 6. Make several more in different shapes if you want. 7. Take your warmers and place them into a microwave for 30-45 seconds.